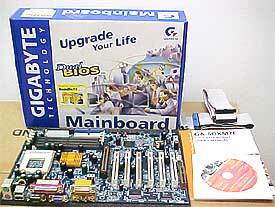 Abstract: Gigabyte has long been a staple manufacturer of highly integrated motherboards. The recent addition of this i815E based board is no exception. The GigaByte GA-6OXM7E motherboard comes equipped with instruction manual, a CD full of drivers and bundled software, and individual IDE/Floppy cables. All for about $170 US. The GigaByte GA-6OXM7E motherboard is a cool looking board because it is blue. Vanity is everything in the sea of brown boards :) Seriously, one of the main reasons this board sticks out so much is the number if integrated features it can claim, including the most important, a dual Bios, and let's not forget, the i815 chipset. The board itself supports Pentium III processors from 500Mhz up to 1.0 Ghz. With 66FSB, 100FSB and 133FSB. Clock multiplier settings go from 3.0 to 9.5. While there are instructions printed on the board instructing the use of JP2 for the Cyrix processor, no JP2 is there... so I'm not entirely sure if it currently supports this processor. Although the PDF file touts a board mounted thermistor in contact with the base of the CPU, none was visible on the board we received for testing. Anyhow, those of you with a Golden Orb can take heart in the fact that Gigabyte has moved those pesky capacitors to the outside edge of where that famous cooler would sit. In fact they even go so far as to outline a circle around the socket 370 which shows that they have left enough room! 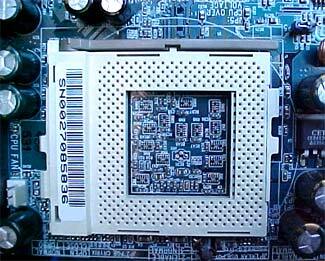 The blue board has no less than six PCI slots, one AGP slot and one CNR slot. There is room for four sticks of RAM, the standard two IDE and single FDD ports, and curiously enough a socket for a digital flat panel tv-out daughter card. Among the list of extra adapter ports that will never see the light of use are: Infrared connector, Modem card power up, wake on LAN header, suspend to RAM activity LED's, secondary USB port, extra SMBUS, smart card reader, front and audio control header. Pg 6. Time for overclocking!